Draft Punk was seen dominating the 56th annual Grammy Awards ceremony in Los Angeles on Sunday. ‘Get Lucky’ won record of the year and the electronic duo of the France, “Random Access Memories” has astonishingly won album of the year at the awards show. The song features Nile Rodgers and Pharrell Williams. Daft Punk who wore helmet in public, won four successive awards. Pharrell Williams and Macklemore & Ryan Lewis have also gained 4 awards for their startling performances. 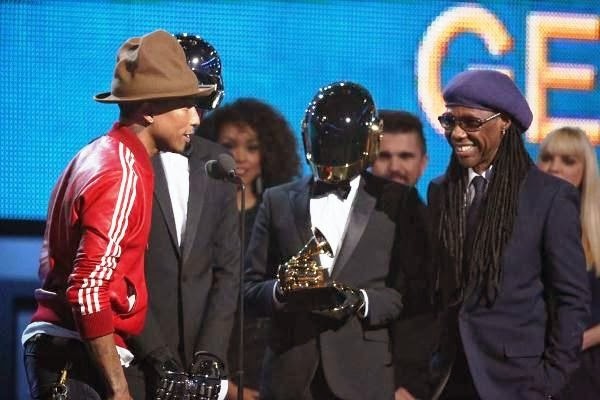 In addition, Daft Punk also picked up awards for best dance in an electronica album for “Random Access Memories,” and also won the pop duo in group performance for ‘Get Lucky’, which ultimately earned Williams a trophy. On the other hand, Williams had already 7 nods, but competed with himself and took home 4 awards.